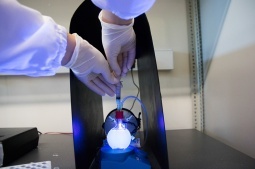 The use of solar light to produce renewable, sustainable and carbon-neutral fuels and chemicals, has recently emerged as an attractive environmentally friendly alternative to traditional technologies. The concept of Solar Fuels refers mainly to the generation of hydrogen from water and products derived from CO2 such as methanol, methane, formic acid and other chemicals. 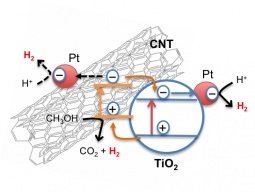 Hydrogen can be produced from water using renewable solar energy through a wide range of processes, namely, electrolysis, photo-electrochemical, photo-catalytic and thermochemical water splitting. Solar fuels derived from CO2, water (a cheap, abundant and environmentally benign solvent) and sunlight (renewable energy source) are sustainable, produce no net CO2 emissions and offer as advantage the production of easily transportable liquid chemicals, such as methanol. 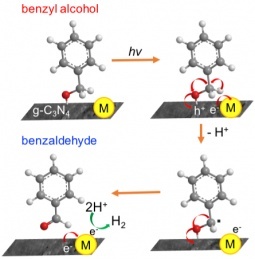 In addition, selective photocatalysis can provide a sustainable route to the synthesis of fine chemicals. The massive release of CO2 to the atmosphere is believed to result in considerable climate changes, therefore a great deal of effort is being directed to reduce its concentration in the atmosphere and to prevent its emissions. The conversion of CO2 into fuels using a solar source has the potential to reduce the consumption of fossil fuels, contributing to reduce human impacts on global warming and to accomplish worldwide targets on carbon footprint reduction. 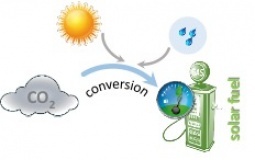 The CO2 reduction into solar fuels by photocatalysis is far from being optimized, and there are still considerable breakthroughs to be achieved before it can be considered as a viable economical process. Our goal is to synthesize highly efficient graphene based-composites with high stability and durability for CO2 reduction under sunlight, with a focus on the selectivity towards CH3OH as reaction product. SEM micrographs for graphene and graphene based-composites. 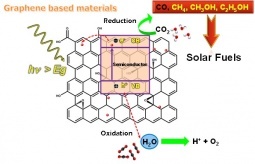 Plausible mechanism of photoreduction of CO2 catalyzed by graphene based-composites. Artificial photosynthesis is regarded as potential long term solution to mitigate the world energy problem since it can lead to the production of solar fuels by photocatalytic water splitting. 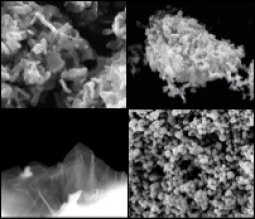 Though a number of semiconductor photocatalysts have been developed, the quest for efficient materials active in the visible region still remains a challenge in order to make the process economical and industrially feasible. 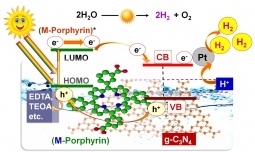 The objective of our research is to mimic the natural process of photosynthesis by combining the components of the multimeric complex of Photosystem II, such as porphyrins and metalloporphyrins, with carbon-based materials (graphitic carbon nitride g-C3N4, graphene, nanotubes), to construct efficient electronically coupled highly stable visible–light-active nanohybrid catalysts, capable of achieving water splitting with minimum possible consumption of energy. 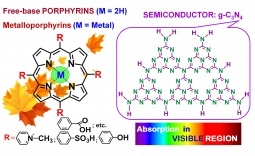 The innovative step is to combine the visible light harvesting capabilities of the metalloporphyrins with the unique electronic, optical and mechanical properties of carbon based materials, when acting as supporting substrates, in order to extend charge separation lifetimes by enhancing the intermolecular donor-acceptor electron transfer process between the porphyrin and the semiconductor, a key step in the overall water splitting process. A common strategy usually applied to increase the efficiency of H2 production by water splitting is to add some sacrificial reagents (alcohols, EDTA, Na2S). Based in this principle, photocatalytic reforming processes gained importance, since H2 can be efficiently produced by photocatalytic degradation of organic compounds present in aqueous media under mild conditions, while simultaneously treating/upgrading industrial wastes or by-products. 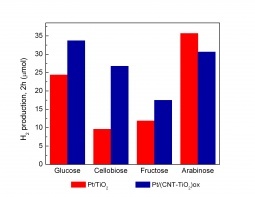 Metal (Pt, Pd, Au and Ir) loaded carbon nanotube-TiO2 composite materials can be successfully used for the photocatalytic production of H2 from biomass-containing aqueous solutions, namely from methanol and saccharides (arabinose, glucose, fructose and cellobiose). Au/ZnO is also a promising photocatalyst for H2 production from ethanol. 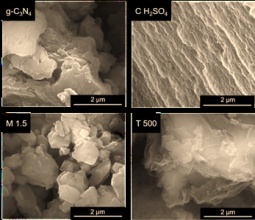 Band-gap engineered nanostructured catalysts, mainly based on graphitic carbon nitride (g-C3N4), are being developed for application in the photocatalytic synthesis of fine chemicals of importance for fragrance, pharmaceutical and agrochemical industries. g-C3N4 can be synthesized through solvent-free routes starting from C and N rich compounds. Due to its polymeric nature, it is possible to exert control over the surface chemistry and morphology via molecular-level modification and surface engineering. One of the main advantages of this material is the possibility of being activated by visible light excitation. Selective photo-oxidations can be competitive for photocatalytic fine chemical applications because of their environmentally friendly and energy sustainable characteristics. In particular, partial oxidation of alcohols to their corresponding aldehydes and ketones is an important reaction at both industrial and lab scale. Some examples are the selective oxidations of benzhyl, vanillyl and piperonyl alcohols to the respective aldehydes: benzhaldeyde, vanilline and piperonal, respectively. Photocatalytic reduction reactions with environmental and industrial importance include the production of azo compounds from nitroaromatics, reduction of epoxydes to alkenes and hydrogenation of ketones into alcohols. 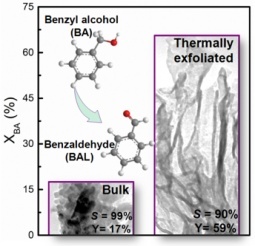 Production of benzhaldehyde from benzyl alcohol using bulk and thermally exfoliated g-C3N4.